Community politics imprisons 90 year old in apartment – Los Gigantes! 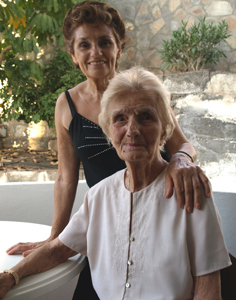 Vera is now 90yrs old, and in recent months she has suffered a stroke as well as a ruptured ulcer, but has miraculously recovered sufficiently to be allowed home and is now in the care of her daughter Janice, who has given up her job to look after her. Janice and Vera were living in Tamaimo in a top floor apartment with 40 steps. Vera, needs 24/7 care, she is unable to walk unaided, and can’t be left on her own. Janice cannot help her Mum up and down the steps on her own. The ladies were virtual prisoners in their own home. Janice was desperately looking for an apartment on the coast, it had to be ground floor with wheelchair access, and she must be able to park close to the entrance to get her Mum in and out of the car. Then I had the answer for them. My ground floor apartment in Florencia, Los Gigantes would soon be available and would be ideal for them. Janice was delighted, there is wheelchair access, she would be able to take her Mum across to the square for a coffee and to see the shops, she could park at the door to get her Mum in and out of her car and it would be much warmer than Tamaimo in the winter for them. There was one slight drawback, the apartment needs to be fully refurbished and that could take several weeks, but there was an answer. They could move into my apartment on the next floor up until the work was done, there was a lift so the problem was solved – or so we thought! A few years ago several of the owners decided they wanted a lift in the building and I was approached and asked if I wanted a share. Being only 1 floor up I really didn’t need use of the lift so I didn’t go in as a shareholder, but I said I had no objections to them going ahead. About 3 weeks ago I approached the community president, the administrators and 3 of the shareholders and asked if the ladies could pay for temporary use of the lift (the lift can only be used with a key). A genuine reasonable request, I didn’t see a problem. The reaction I received was unbelievable. The answer was clearly no – you are not a shareholder. “But it’s not for me it’s for a 90 year old lady who is in a wheelchair and they are offering to pay” For the next two weeks I was run around in circles and could get no clear answers of how to get a key. The administrators of Florencia said it was not up to them. The community president was unhappy to say the least that the administrator had given me her telephone number and the fact that it was for a 90 year old in a wheelchair she declared it was not her problem. I can’t put into words how I felt. Now in a dreadful dilemma I was left with no choice but to get legal advice. The lawyer’s jaw dropped in disbelief when I explained the predicament. I gave him a list of all the information, “leave it with me and I will see what I can do”. The lawyer was given the exact same run around as me! Now frantic, the night before the ladies moved I had one last idea. I spoke to three of the shareholders, all well known business men in the village, and asked each one if they could possibly help the ladies and let them have a key at least for the move as they had all their own furniture. They all told me “NO” and one of them told me to carry the ladies and all their furniture up the steps myself! I really can’t repeat my reply. On the morning of the move my lawyer made one last attempt on behalf of the ladies. He spoke with the President and the Administrator, as well as three of the other key holders and, guess what??? Vera and all her furniture were carried up the stairs and due to community politics she is once again a prisoner in an apartment.